Summer Safety: Check Your Tire Pressure | Resmini Law, LLC. Warm temperatures and abundant sunshine make summer the perfect time to take a travel. Whether your adventure is cross-state or cross-country, you should be sure that your vehicle will help you reach your destination safely. Oil filters and batteries get plenty of attention, but tire pressure often gets mistakenly overlooked. According to the National Highway Transportation Safety Agency, a tire that is 25% below its correct pressure is three times more likely to be involved in an accident. Conversely, a tire that 25% above the recommended pressure is twice as likely to cause a crash. Making sure your tires are properly inflated is very easy and only takes a few minutes of your time. Once a month, drivers should either stop by their local gas station or purchase a handheld pressure gauge to measure their tires’ air pressure. If the tires are under or over inflated, drivers should fill them up to the correct level. Modern gas station air pumps are intuitive – all one needs to do is set the desired psi (pound per square inch) and connect the air hose to the tires. Many systems will make a beeping noise once the air pressure reaches the correct level, signaling that the hose can be detached. Not sure about the correct psi of your tires? Consult your car’s manual for the correct front and rear psi levels. In many vehicles, such information can also be found on the interior of the gas tank door. Car owners are advised to check their tire pressure once a month or before any road trip. If tires are consistently under inflated, it’s best to bring the vehicle in for inspection, as there may be a leak present. As of 2007, all motor vehicles come standard with an air pressure monitoring system. Tires that are under inflated can also seriously impact the average miles per gallon (MPG) of your vehicle. According to fueleconomy.gov, a vehicle’s MPG can drop 0.2% for every 1 psi under the correct number. Over time, drivers whose tires are under inflated will be shell out more at the pump than drivers whose tires are properly inflated. Under inflation also causes tires to experience more wear and tear than properly-inflated tires. As with fuel efficiency, this can become costly for drivers who are replacing their tires more often than they should be. Drivers are afforded a wealth of options when it comes to their tires. All-season tires offer year-round benefits, while winter, or “snow tires”, offer adaptability on icy and snowy roads. What many drivers may not realize is that “summer” tires are also available for high-performance vehicles. Summer tires offer less grooving, better handling, improved braking abilities and overall better performance in wet conditions. The tread patterns of summer tires are also specifically designed to deliver better traction and grip on dry roadways. Summer tires are not a perfect fit for every vehicle and drivers should consult their car care expert if they are unsure about which type of tire is best for their vehicle. Borrowing some wheels for your summer road trip? Make sure that your rental does not come equipped with under or over inflated tires. Many car renters are far too trusting when it comes to the vehicles they are provided with. Take the rental car to the nearest gas station or better yet, bring your own tire gauge to measure the air pressure on the spot. If the tires appear to be under or over inflated, consult the rental company and be sure they are adjusted to the correct levels. 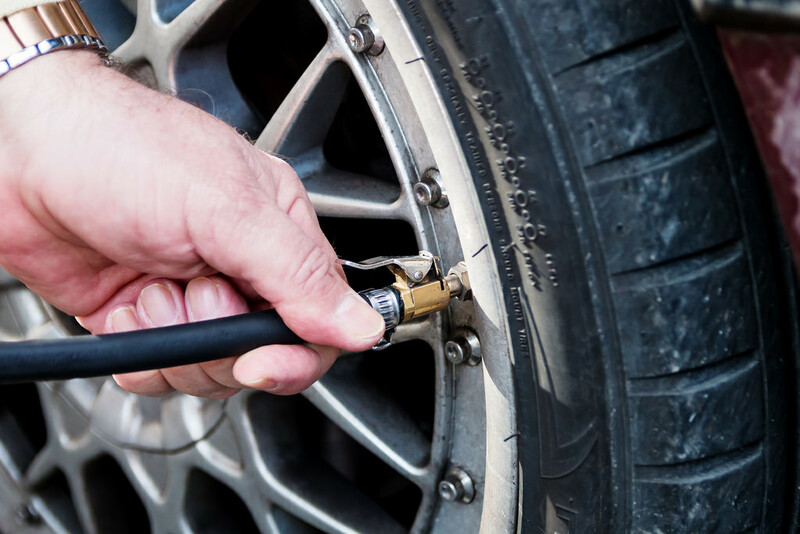 Making sure your tires are properly inflated will help to decrease your chances of an automobile accident, improve your vehicle’s fuel efficiency, and provide you with plenty of peace of mind as you embark on your summertime journey.